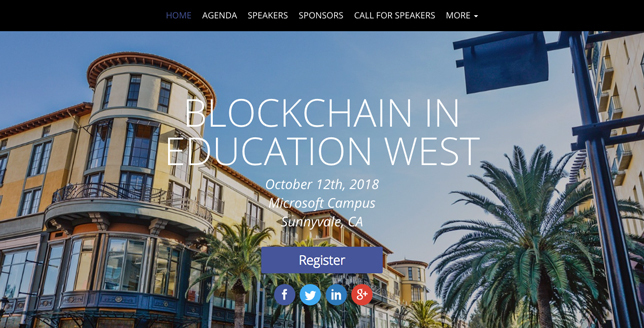 The "West" edition of "Blockchain in Education," hosted by the San Jose Evergreen Community College District, takes place on Oct. 12 at the Microsoft campus; and the University of the District of Columbia Van Ness Campus will host the "East" version on Nov. 13. Participants will receive blockchain certificates produced by ORU as well as paper-based certificates of attendance. According to the agenda of the West Coast event, the conference will introduce blockchain concepts and explore how blockchain can be used in an educational environment. Speakers include Byron Clift-Breland, chancellor of San Jose Evergreen Community College District, and Sudhir Wadhwa, a lecturer at Santa Clara University and chief technology officer for Viridis Learning, a company that helps students identify their career pathways and provides tools for helping them track and share their achievements. The agenda for the East Coast event will be announced soon; speakers include Feng Hou, CIO and chief digital learning officer for Central New Mexico Community College, and Loretta Early, CIO for George Washington University.